In the introduction chapter we will focus on the meaning of investment appraisal, justification of doing the project and the objectives of this project. One of the key areas of long-term decision-making that firms must tackle is that of investment – the need to commit funds by purchasing land, buildings, machinery and so on, in anticipation of being able to earn an income greater than the funds committed. In order to handle these decisions, firms have to make an assessment of the size of the outflows and inflows of funds, the lifespan of the investment, the degree of risk attached and the cost of obtaining funds. Identifying project(s) to meet needs. Maintenance – replacing old or obsolete assets for example. Profitability – quality, productivity or location improvement for example. Expansion – new products, markets and so on. Indirect – social and welfare facilities. Even the projects that are unlikely to generate profits should be subjected to investment appraisal. This should help to identify the best way of achieving the project’s aims. So investment appraisal may help to find the cheapest way to provide a new production, even though such a project may be unlikely to earn profits for the company. Here, we are going to compare between two-investment appraisals. These two are going to be about jute and tea. We will discuss which of these two will be more profitable as an investment. As we are discussing about jute and tea, we need to know and justify these crops according to the situation in Bangladesh. The economy of Bangladesh is mainly based on the agricultural production. Actually, the agricultural products are running the economical wheel. In this way, both jute and tea are very important. These crops earn us a huge amount of foreign exchange. Jute is the main cash crop of Bangladesh. 5.32% of the entire foreign exchange we earn is from jute and its other production. Bangladesh is the second country to produce most amounts of jutes over the world. 26% of the main production is now growing in Bangladesh. It is good for business too as it returns a good profit. Tea is one of those cash crops that earn us a good amount of foreign exchange. It is the second crop that gives us most foreign money. 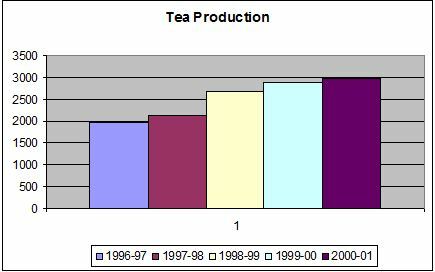 Business of tea and its other production are profitable too. So, we can invest on either jute or tea. But we do not know which of these two is more profitable for an investor. As a matter of fact, we are going to find it out in this project. Agriculture remains the most important sector of Bangladeshi economy, contributing 19.6 percent to the national GDP and providing employment for 63 percent of the population. The 3 main crops—rice, jute, and tea—have dominated agricultural exports for decades, although the rice is grown almost entirely for domestic consumption, while jute and tea are the main export earners. In this project we will find it out the profitability of jute and tea and from which sector we can earn more profit and where we can invest. Jute, often called the “golden fiber” of Bangladesh, is the main export-earner for Bangladeshi agriculture, as Bangladesh remains the world’s second-largest producer of jute (after India) and the world’s largest exporter of fiber. Jute is traditionally used for the fiber of carpet backing, burlap bags, cheap paper, and various other purposes. Its importance for the Bangladeshi economy comes from the fact that almost 3 million farms are involved in jute production. In 1999 Bangladeshi export earnings from jute amounted to US$55 million, with the country producing 720,000 metric tons of jute, although this is about one-third of the jute production of the middle of the 1980s. The decline in jute production is attributed to declining world prices for this crop and to farmers switching to other crops. Now we will see the graph of the value added at current price jute of five years. Tea is an evergreen, perennial, cross-pollinated plant and grows naturally as tall as 15m. However, under cultivated condition, the bush height of 60–100 cm is maintained for harvesting the tender leaves for even more than 100 years. The flowers are white in color and grow singly or in pairs at the axils. The fruits are green in color with 2–3 seeds. The leaf is the main criterion by which the three types of tea are classified as follows. In Bangladesh there are three kinds of ownership of tea gardens: foreign owned sterling companies, Bangladeshi Joint Stock Companies and privately owned proprietary tea estates. In early 1990s, a total of 12 sterling companies were in tea business. They owned 26 gardens; all located in Maulvibazar and Habigang districts. Fifty Bangladeshi companies owned and operated 73 gardens, of these the National Tea Company owned 12 and 57 were under proprietorship management. Here is the graph of see the value added at current price of tea of five years. In this chapter we will know about the meaning of Profit, Net Present Value (NPV), and Profitability Index (PI) and about the rules, which we can accept or rejected. Here we will also calculate the cost of jute and tea, the return of the investment of jute and tea, the net present value and the profitability index of jute and tea. Profit means the net earning from an investment. NPV is a technique where cash inflows expected in future years are discounted back to their present value. This is calculated by using a discount rate equivalent to the interest that would have been received on the sums, had the inflows been saved, or the interest that has to be paid by the firm on funds borrowed. If PI is greater then 1 (PI> 1) then the project will be accepted. If PI is less then 1 (PI< 1) then the project will be rejected. If PI is equal to 1 (PI =1) then the project can be accepted or rejected. To invest in jute production we need capital for fixed and variable cost. We need land (Fixed cost), labor, seed, fertilizer, insecticide, tiller, transports (Variable costs), etc. We also need capital to invest for tea production as fixed and variable cost. We need land (Fixed cost), labor, plant, fertilizer, insecticide, tiller, transports (Variable costs), etc. In this chapter we have calculated the total costs, total return, net present value and profitability index of production of jute and production of tea. Now we will compare between these two productions. Though the production of jute and production of tea both are profitable for investment but comparatively we can see the jute production is more profitable then the tea production. We can see that the NPV and PI of jute production is greater then tea production. In both project the NPV and PI is acceptable for any investor. But investment in jute production is more profitable then tea production because of its higher NPV and PI. So we will invest our money in jute production. This is a framework of this assignment. This assignment shows the use of NPV and PI. By using NPV and PI we can easily find out the more profitable project from several projects. The summary, conclusion and recommendation of this assignment are discussed here. In the first chapter the meaning of investment appraisal, justify the causes of the comparing jute production and tea production and objectives of this assignment are shown. Chapter two is focused on the overview of the value added at current price of jute and tea of five years of Bangladesh by collecting data and the overview of jute and tea. Chapter three focused the meaning of Profit, Net Present Value and Profitability Index. 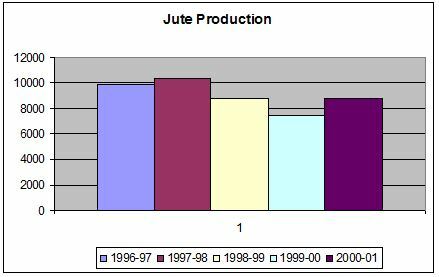 Here we have shown the costs and probable return of jute production and tea production. We calculated Net present value and Profitability Index of jute production and tea production by using our costs and return. Here we compared between the investment of production of jute and production of tea and chosen jute production to invest. The comparison between two investment appraisals is discussed in this assignment. We use NPV and PI for selecting the more profitable project from two different projects. We have collected data from the statistical yearbook and the different websites. We are especially thankful to our course instructor Dr. Laila Anjuman Ara for assigning us in this task so that we have inspired to prepare this assignment. Increase the area of production. Have to use more effective seeds and plants. Government has to concern in these departments. Have to increase the loan in these two sectors. Have to stop cut down of trees in the hilly areas. Have to improve the industries situation. Have to give proper salary to employees. Finally we can say that jute and tea are very important agricultural crops. We can earn a good number of foreign currency by exporting jute and tea. Both are playing an important role in our national economy. So we have to increase the production of jute and tea and also have to concern about the people and industries related with jute and tea.